A 40 minute walk in Vancouver is considered a casual stroll. However in Cambodia, it is a sweating nightmare. On this fateful day, it began with our arrival back to Phnom Penh via sleeper bus. For foreign passengers, you never truly know where your stop is at on a sleeper bus unless you use a map or when you are at the last stop. This is where the bus driver either shouts in Khmer, or starts blasting music through the speakers. Make sure your phone is connected to the local cell network. 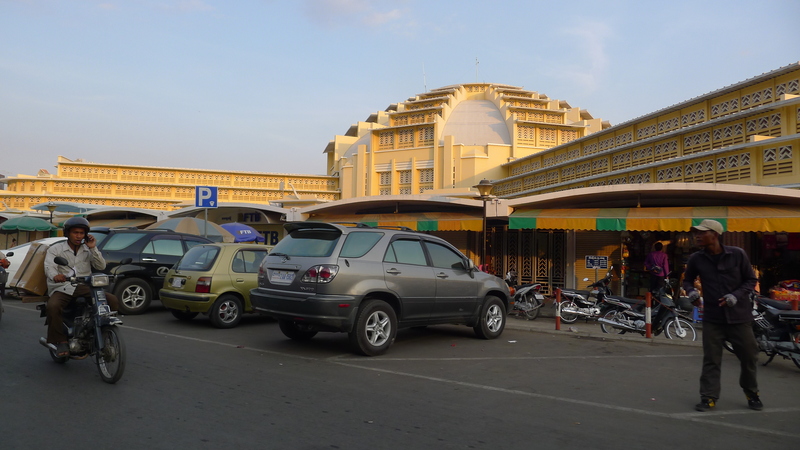 We set out for the Central Market near downtown Phnom Penh. Clarence led the way and told us that it was within walk able distance. It turned out to be at least a 25 minute walk. It was not too bad, just unexpected for Lawrence and Jonathan (walking 25 minutes in the sun is not the same in Phnom Penh as it is in Vancouver). Here you can find counterfeit electronics including iPhones, Android phones, and watches. The atrium branches off into a maze of wings that sell very inexpensive clothing, shoes, and backpacks. We ate at a stall where Lawrence did THE Mark Wiens impression. We then left the market and bought our next ticket to Ho Chi Minh City for $10 (We saw the same bus ticket just around the corner for $8). Tip: Always shop around. Travel agencies are usually grouped together so it only takes a few minutes to get a handful of prices. Agencies are likely selling tickets for the same bus anyway so save those dollars where you can and use them toward meals instead! We then proceeded to a supermarket to buy some snacks for the 6 hour bus ride the next morning to HCMC. We headed back to our hotel at 3pm and that was the end… we slept until the next day, skipping dinner. We thought about buying dinner at the local mall, but we all saw each other sleeping at different moments and gave up. Posted in Cambodia. Bookmark the permalink.